A kind reader has sent me this link to an FoI request that’s just been disclosed by Tower Hamlets council. Actually, there was no need to FoI it as it is a public document, but all the same, I think it will make interesting reading for most people. 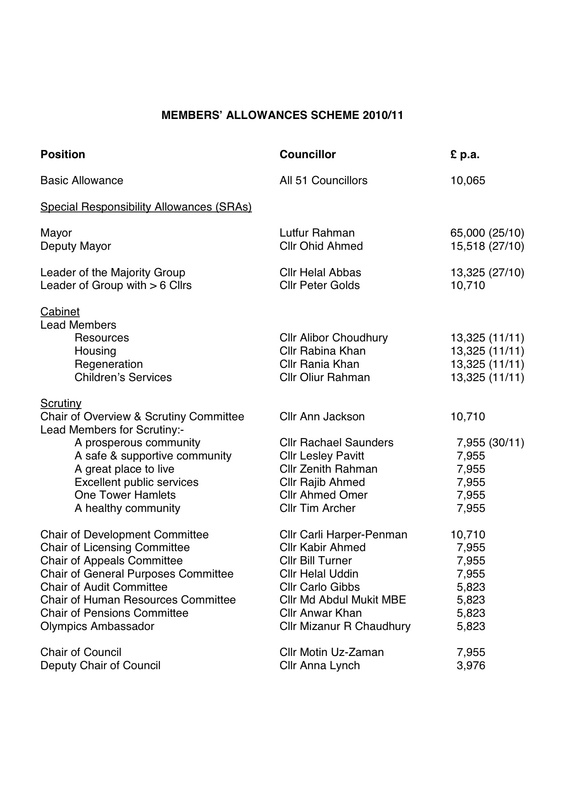 It’s a list of the Special Responsibility Allowances paid to Mayor Lutfur Rahman and 24 councillors. That means almost half our 52 elected representatives are being paid over and above the £10,065 they get as basic councillor pay. And that’s before Lutfur, if he finally manages it, fills another few members of his cabinet at £13,325 a go. Some of these positions, such as the chairs of the Development Committee (Cllr Carli Harper-Penman) and Overview and Scrutiny (Cllr Ann Jackson), do involve a fair amount of work, but whether an extra £10,710 is the right amount, I don’t know. Other positions attracting serious pocket money defy belief. Take the General Purposes Committee, for example. Its chair, Cllr Helal Uddin of Bromley-by-Bow, trousers almost an extra annual £8,000 for presiding over a few hours extra work a year, if that. Check out this link and you’ll see there has only been three meetings this financial year. In total, there have been four agenda items, all of which were simple rubber stamp reports such as agreeing the terribly crucial appointments to the Billingsgate Market Consultative Advisory Committee. I once sat in one of these meetings to see exactly what went on and the answer was pretty much nothing. The councillors usually arrive late, the officers (who claim the evening sessions as lieu time) sip tea and nibble biscuits, and then the meeting is usually over within a matter of minutes. Then there is Mizanur Chaudhury who get £5,800 for being an “Olympics Ambassador”. What?? Why?? Shouldn’t he be doing whatever he does for free, just for the pure privilege? That there are so many paid positions is a corruption of our system. They are the paid vote. Some 500 council staff will soon lose their jobs. Many of these payments should also go. Given that most of the recipients are Labour members, Mayor Rahman, who while council leader was the worst offender for paying his mates, might well propose such a move. Councillors wouldn’t dare squeal if that happened. Not even Tower Hamlets councillors…or would they?